This is what I mean when I talk about The Real Key West. Theo Glorie -- you remember Theo, from the Key West Coffee Plantation -- is heading up a campaign to preserve the schooner Western Union as a part of the heritage of our fair city. The idea arose in conversations at the coffee shop when it became known that Historic Tours of America decided to sell the ship, which it has owned for the past ten years. HTA sold off the Schooner America a couple of years ago. It was purchased and sailed off to California (reportedly) and then to parts unknown. What's unique about the Western Union is that she is a real Key West ship, launched from here in 1939 (the year I was lauched) and remained in service to the Western Union Telegraph Company until 1974. She has been sailing from Key West's Historic Waterfront since 1997. Now she needs to go into a shipyard for repairs and refitting. 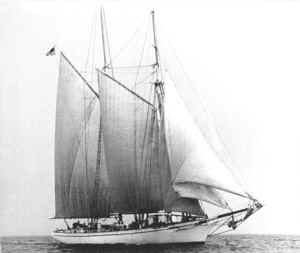 The Schooner Western Union Project is established as a not-for-profit corporation and seeks to raise the money to have the ship overhauled and returned to service to remain in Key West as flagship of the Conch Republic Navy. We'll report on progress here and let you know how to contribute to the project as soon as that information is available. Maximum kudos to Theo and those others who are particpating in the project. You are the strongest link. There is a website that we started for our project.